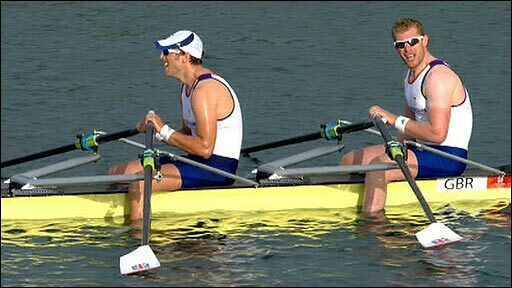 Great Britain won the Olympic title in coxless fours for the third successive Games after a thrilling late surge. Andy Hodge, Peter Reed, Steve Williams and Tom James came from three-quarters of a length down to beat Australia. "I don't know where that last 250m came from. I was in so much pain - I've never been in that pain in my entire life," said Hodge. Women's double Elise Laverick and Anna Bebington and men's duo Matthew Wells and Steve Rowbotham both took bronze. 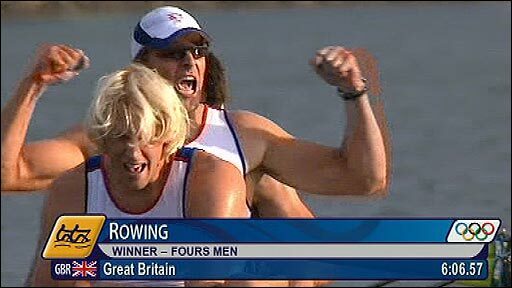 Steve Williams is the only remaining member of the coxless four - led by Matthew Pinsent - that triumphed in Athens in 2004. He and Reed have been the ever-presents this season as Hodge and James have suffered with back injuries and the crew have endured inconsistent results. They only raced in their first-choice line-up for the first time at the start of the Olympic regatta. "It was very, very tough. We had a very tough four or five months," Williams told BBC Sport. "[Coach] Jurgen Grobler kept telling us no one could beat us but sometimes it was hard to believe him." Reed said: "I'm so relieved and happy. It's not a gimme. It was so difficult. We were on the ropes and we put together the best finish we've ever had." Welshman James added: "We knew we were going to be attacked really hard. We had so much belief." Rowbotham and Wells missed out on silver by 0.05 seconds - they were in second place behind Australia's David Crawshay and Scott Brennan until the last few metres but were passed by Estonia. "It was very disappointing not to get the gold, extremely disappointing not to get the silver but you never pass up an Olympic medal. I'm just delighted," said Rowbotham. Wells added: "In that last couple of strokes I thought we had it but I'm really pleased to have come away with something." 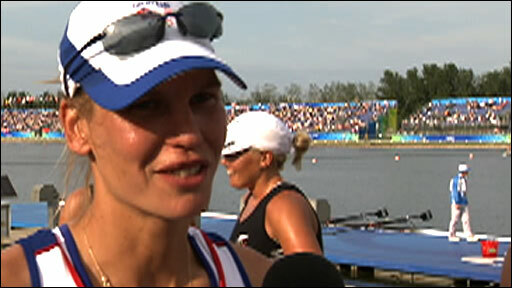 Laverick won her second successive bronze in the double sculls, after achieving the feat in Athens four years ago. In front of GB, New Zealand sisters Georgina and Caroline Evers-Swindell passed Germany on the last stroke to defend their title. "We left it with too much to do but - in Anna's first final - we were nearly there," said Laverick. "I said I was going to stop after this but now who knows?" 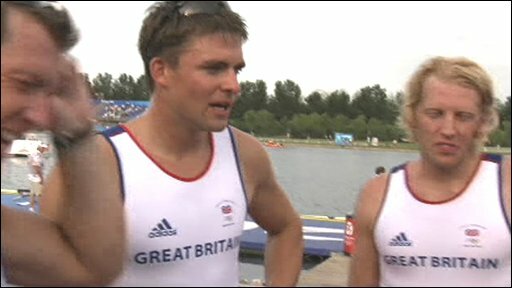 In the men's single sculls, Britain's Alan Campbell finished fifth after leading for much of the race. Campbell was also pleased with his efforts at the end of a season interrupted by knee surgery. "I got to 750m to go and couldn't step on. I tried to give it everything I had but there wasn't a stroke left in me at the end," he said. "I did my best performance possible but I needed those five weeks in the boat." GB women's pair Louisa Reeve and Olivia Whitlam came last in their final but had already surpassed expectations.